U.S. Navy minesweepers are relatively small naval warships designed to counter the threat of sea mines. They have two primary purposes in naval warfare. One is to clear waterways of mines to protect the nation's warships and merchant shipping. The other is to clear a safe path for warships to engage in battle or for safe launching of amphibious landing, which was a vital tactic during World War II. In addition to detecting and removing enemy mines from shorelines and sea lanes, these ships also served as patrol vessels and conducted anti-submarine warfare maneuvers. Minesweepers were often the first Navy vessels to move into a new theater of operations, well before the destroyers, battleships and aircraft carriers, and enabled those vessels to carry out their important missions. In the wake of the First World War, the U.S. recognized the dangers associated with sea mines and made efforts to minimize the possible damage they could cause during combat. 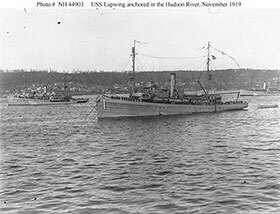 As a result, the first U.S. Navy minesweeper, USS Lapwing (AM 1), was constructed in 1917 and commissioned in 1918. USS Lapwing was named after the lapwing bird, which is known for its slow, irregular flapping flight and its shrill wailing cry. It was the first of 521 ships with the designation AM. The largest and most notable class of minesweepers during these years was the Admirable class, which were a part of the AM designation. With a total of 170 vessels, including 33 whose construction was cancelled, the Admirable-class ships carried a wide range of weapons, including machine guns, artillery and anti-submarine depth charges. One notable vessel, USS Hazard (AM-240), escorted convoys from San Francisco to Pearl Harbor, then out to the South Pacific. The vessel also took part in minesweeping and anti-submarine operations before the U.S. invasion of Okinawa in 1945. Today, the only active minesweeper class is the Avenger class, which is a part of the MCM ship designation. These ships were built with significantly lower acoustic and magnetic signatures to avoid detonating sea mines. While most modern ships in this class were built with a steel hull, the Avenger class was built with a wooden hull with a fiberglass coating. 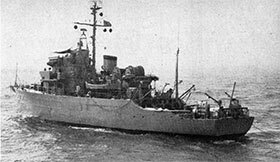 From the Great Depression through the end of the Vietnam War, the U.S. Navy used hundreds of products containing asbestos in the construction of minesweeper ships employed throughout the conflict. The mineral is versatile, inexpensive, plentiful and lightweight, making it an ideal component for ship construction. The fibers are also highly resistance to fire and extreme heat. Asbestos was widely used in insulation around engine boilers, and other compartments that experienced high temperatures. Steam pipes were insulated with asbestos cement, asbestos cloth and asbestos pipe covering. Asbestos packing, felts, pads and gaskets could also be found all over the ships. According to a listing of components used to build Navy vessels, more than 300 parts included asbestos as a major component. All of these asbestos-containing products can degrade over time or become agitated with daily use, releasing its fibers into the air. Once the fibers are inhaled, they can become lodged into the lining of the lungs and with persistent inhalation, the accumulation of fibers may cause mesothelioma cancer or other asbestos-related diseases. From boiler rooms, to engine rooms and even crew sleeping quarters, asbestos products were widely dispersed throughout most areas below deck in all minesweepers. Just about any U.S. Navy veteran who spent any amount of time on these ships is at risk for exposure and for asbestos-related illnesses. Those at perhaps an even higher risk for exposure include shipyard workers who were responsible for the construction of these ships and those who performed routine maintenance aboard the ships. This includes workers who completed various jobs such as painting, pipefitting, electrical work, welding, plumbing, insulating, repairing, and general contracting and construction of these ships. Despite the U.S. Navy’s efforts to reduce the overall amount of asbestos and the number of asbestos-containing products aboard its ships beginning in the 1970s, prior widespread use of the toxic material has resulted in generations of hazardous exposures. Archived official documents including repair logs, purchase orders and related letters and memos confirm the considerable use of asbestos products aboard U.S. Navy minesweepers. Documents pertaining to the Lapwing-class minesweeper, USS Tanager (AM 385), confirm the use of asbestos mittens on board to protect workers’ hands from high temperatures, as well as ample use of asbestos insulation in a number of ship compartments, including vermiculite insulation, which may contain asbestos. 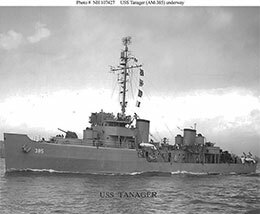 Asbestos insulation was confirmed on USS Tanager in the main and auxiliary exhaust, engine trunks, reduction gears, air compressors, a boiler, and a distilling apparatus. Asbestos use was also described aboard other AM minesweepers, including USS Strength (AM 309), USS Direct (AM 430), USS Avenge (AM 423), USS Peregrine (AM 373) and USS Surfbird (AM 383). Minesweepers are designed to sweep the seas of various types of mines. These ships are equipped with tools to effectively detonate enemy mines to secure a safe travel path for merchant ships and war ships. Modern minesweepers, the few that remain, are equipped with advanced technology to reduce the chances of detonating mines themselves. They are soundproof to reduce their acoustic signature, which can detonate mines. They are also primarily built from wood and glass-reinforced plastic to reduce its magnetic signature, which also detonates sea mines. These ships made their debut in the First World War, but their role was minimal. During the years leading up to World War II and during the war, they really began to make an impact in naval battle. This success did not last long. The Korean War pointed out major faults in U.S. minesweepers and prompted revolutionary minesweeper construction. The result was a fleet of ships that proved successful in the Vietnam War. Because U.S. Navy minesweeper construction didn’t start until 1917, the ships didn’t make a significant impact in the First World War and only had a role in the last couple months of the war. Nonetheless, approximately 30 minesweepers with the designation AM were deployed to clear the North Sea Mine Barrage between the shores of Scotland and Norway to inhibit the movement of the German U-boat fleet. Some ships continued their service of sweeping sea mines through 1919, even after the war ended. The role of minesweeping made a more significant advancement during the Second World War. During this time, the majority of all AM minesweepers were built and commissioned. Better prepared for the minesweeper’s role in war, the U.S. deployed approximately 480 ships to detect sea mines. A World War II minesweeper would tow two buoys, called paravanes, behind the ship. Steel cables that were attached to the paravanes would sweep just under the surface on both sides of the ship and would cut through the mine’s mooring cables. When the released mine would float to the surface of the water, it was destroyed by gunfire. These ships conducted sweeping operations from the beginning to the end of the war, while also completing patrol missions, escorting convoys, and conducting anti-submarine warfare maneuvers. As the Second World War came to an end, the Navy focused its time and resources on developing Navy Aircraft Carriers, but the Korean War prompted President Truman’s acknowledgment of the dangers posed by sea mines and the importance that minesweepers could have in the Korean War. 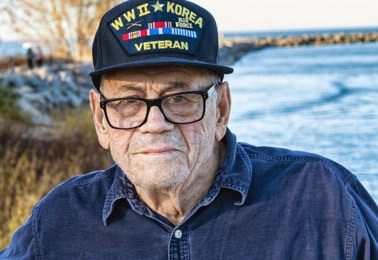 He ordered U.S Armed Forces into battle in 1950, and Mine Squadron 3 was sent to clear enemy sea mines around Korea’s east coast. To further inhibit southward movement of the North Korean People’s Army, USS Chatterer, USS Kite, USS Mockingbird, USS Osprey, USS Partridge, USS Pledge, USS Redhead and USS Osprey completed a sweep from the port to the approaches and stood their ground. By the end of the war, 70 percent of all U.S. Navy casualties were caused from Korean mines, and U.S. minesweepers were hit with the wide use of magnetic mines by Communist forces, which were detonated by the magnetic field of the steel-hulled ships. This fault prompted the U.S. Navy to build a new designation of minesweepers to counter North Korea mine threats, which later made a more significant impact during the Vietnam War. These news ships became known as ocean minesweepers, MSO. As a result of the Korean War, the U.S. undertook major construction of the new MSO series on a large scale. During the 1950s, 65 new ships with MSO designations were built. MSOs had the ability to sweep for moored contact mines as well as bottom magnetic and acoustic mines. These new ships consisted of three classes; the Agile/Aggressive class with hull numbers 421 to 507; the Acme class with hull numbers 508 to 518; and the Ability class with hull numbers 519 to 522. In contrast to prior steel-hulled minesweepers that served in World War II, these new ships were smaller and constructed mostly of wood with bronze and non-magnetic stainless steel fittings to minimize their magnetic signature. All of the 1950s-era minesweepers were first equipped with UQS-1 mine-locating sonar, which were later upgraded to SQQ-14 sonar. During the Cold War, favorable U.S. mine warfare tactics were derived from a European war method that relied on the participation of North Atlantic Treaty Organization (NATO) allies. 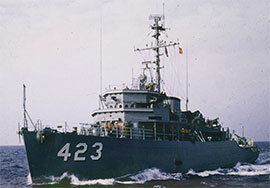 Two U.S. Navy minesweepers were crucial in these tactics: USS Aggressive (MSO 422) and USS Acme (MSO 422). 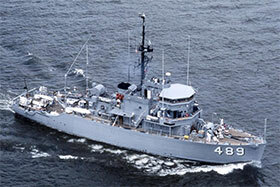 In the early 1980s, the U.S. Navy began construction of another new minesweeper series, which were given the designation MCM for Mine Countermeasures Ships and were classified as the Avenger class. These ships were designed as minesweepers and hunter-killers that are able to find, classify and destroy moored and bottom mines and are responsible for clearing mines from vital waterways. MCMs are equipped with sonar and video systems, a remote control mine denoting device and cable cutters. These ships are built primarily from wood with fiberglass sheathing. The presence of four minesweepers was vitally important during the Iran-Iraq War, also known as the First Persian Gulf War, from 1980 to 1988, and in Operation Desert Storm in 1990 and 1991 when USS Avenger (MCM 1) and USS Guardian (MCM 5) conducted major MCM operations. USS Lucid is the last surviving U.S. Navy MSO hull, and it is in the process of being restored as a museum piece. USS Hazard remains as the last Admirable-class minesweeper in the U.S. The current outlook for present and future minesweepers is bleak. During the past decade, the U.S. Navy has dramatically decreased its minesweeper force, leaving only the Avenger-class ships to perform the once highly important duties. Consequently, the last minesweeper class may eventually be replaced by new littoral combat ships, which will be supplied with mine countermeasure equipment as a part of their interchangeable mission gear. Bruhn, David, D. (2009). Wooden Ships and Iron Men: The U.S. Navy's Coastal and Motor Minesweepers, 1941-1953. Maryland: Heritage Books Inc.
Bruhn, David, D. (2006). Wooden Ships and Iron Men: The U.S. Navy's Ocean Minesweepers, 1953-1994. Maryland: Heritage Books Inc.
Lott, Arnold S. (1959) Most Dangerous Sea: A History of Mine Warfare, and an Account of U.S. Navy Mine Warfare Operations in World War II and Korea. Annapolis: U.S. Naval Institute.